Arielle Martin in front of her setup at 1441 Woodward. PHOTO: Bruce Turner. When Arielle Martin is not selling a home, she is selling products that will make your home leave a lasting impression on whoever enters it. 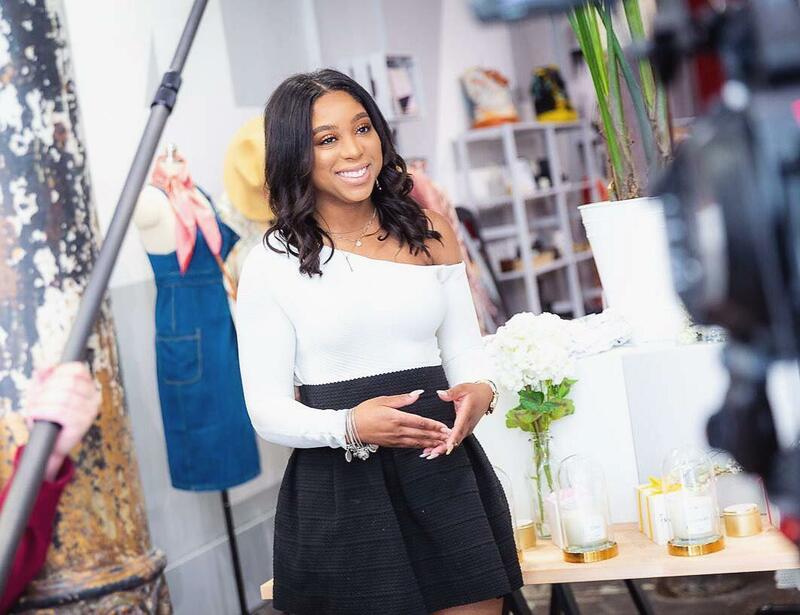 The 23-year-old real estate agent is also the creator and owner of Front and Scenter luxury candles and handmade fragrances, which specializes in coconut-soy wax candles and room/linen sprays. Martin started her candle business in December 2017 and the flame has been burning hot ever since. The idea to make her own candles started off as just a project for Martin. But they were garnering interest from family and friends, so, she decided to market and sell them. Martin graduated from Wayne State University in 2016 with a degree in business administration with a concentration in finance, so, she had the credentials to be able to run a business. Something that started off as an idea in Martin’s kitchen, turned into Front and Scenter being one of the more sought-after candle products in Detroit. Front and Scenter currently offers six candle and room spray scents, from “Baection” and “Queen Bee”, to “Prince Charming” for the guys. The candles are eco-friendly, with a 100 percent cotton wick and come in regular 8-ounce or 4-ounce travel-size jars reusable jars. The sprays are made of perfume grade oils, making it safe for skin contact. All the fragrances are curated and hand-poured by Martin. Martin’s day job is selling homes to buyers in the metro Detroit area. It is her passion and she is not letting it take a backseat to her candle business. In fact, she has found a way to make the two work as a team, providing her clients with a Front and Scenter candle once they have found a home to settle in. Martin is currently selling her candles and sprays out of the 1441 Woodward Collection as part of the Downtown Detroit Markets. She heard about the opportunity through a friend, Tee Capel, who is selling her Fly Behavior brand of clothing, along with a number of other brands at the retail incubator. Martin admits that she was a little nervous about the opportunity, since her business is fairly new, but the possibility of being front and center on the ever-busy Woodward corridor is one she could not pass up. She will be there through August 31.